Rwanda and Burundi, two small, mountainous, landlocked countries in Central Africa, have emerged over the last few years as significant producers of high-end specialty coffees. Both started their climb to prominence already in possession of the most fundamental ingredients for success: High growing elevations and extensive plantings of distinctive-tasting heirloom Bourbon-related varieties of Arabica. Small holders organized into cooperatives produce virtually all of the coffees in both countries, which means the socio-economic story is a positive and moving one. This is particularly true for Rwanda, where its entry into the high-end coffee market with the potential for better returns for growers has been a prime mover in the almost miraculous healing of a society ripped open in 1994 by one of the most horrific genocidal conflicts in modern history. Emergence of Burundi as a fine coffee origin has been more gradual, apparently encouraged by liberalization of export regulations, which has permitted coffee mills or “washing stations” to market their green coffees by year and by lot, rather than bulking them into relatively anonymous shipments from large associations of cooperatives. The challenge for both countries is transportation: getting the coffee out of the highlands and (usually) through the sweltering port of Mombasa without having it sit and simmer in equatorial heat. The limitations imposed by poor coffee infrastructure have particularly plagued Tanzania, the large country that sits between Burundi and Rwanda and the ocean. Tanzania should be a major source of fine coffee as well, but over the years few Tanzanias have reached us, with this year apparently no exception. We received five samples and reviewed two, both at 90. Returning to Rwanda and Burundi, what can a devotee of fine coffee expect from this year’s crop? Judging by the total of twenty-nine Rwandas and Burundis we cupped this past month, classic, elegantly Central Africa Bourbon character if you find fresh crop coffee purchased by astute green buyers; decent but faded Africa Bourbon character if you get last year’s crop purchased perhaps by less selective buyers. Regrettably, we were a little early with this review. New, 2012 crop coffees were just beginning to arrive in April, so I would estimate that over half of the coffees we cupped were last year’s crop. Most of these solid but apparently rather faded coffees did not make the cut at 90, but rather hovered in the 86 to 89 range. What did strike me about both old and new crop Rwandas and Burundis, however, was the relatively continuity of cup profile. Particularly with the Burundis, perhaps just a little less so with the Rwandas, the characteristic flavor complex I associate with Bourbon-related cultivars grown in the high elevations of Central Africa and Kenya tended to dominate: A fruit character tartly sweet in taste, blackberry-like in flavor, but dryish in mouthfeel. I hope that description sounds at least potentially attractive to coffee newcomers; in the greatest of Kenyas and the best of Rwandas and Burundis it can be one of the most pleasingly and elegantly complex coffee characters possible. It often is supported by various complex floral notes and by crisp, nutlike cocoa and other, rounder and deeper, fruit notes. For me, the potential weakness of such profiles is the dry mouthfeel, which in older or lesser versions of the type can come across as woody and astringent rather than crisp and dry. This was the case with many of the Rwandas and Burundis that arrived earlier in the month and which were probably last year’s crop. Later and presumably fresher arrivals tended to show the positive side of the profile: livelier, with the dryish mouthfeel boosted by a berryish juiciness and/or floral richness. The Terroir Burundi Ngozi Gihere 2 (91) probably showed this character with the most classic lucidity, with the Temple Burundi Mumirwa (90) a drier and more delicate but equally explicit expression. 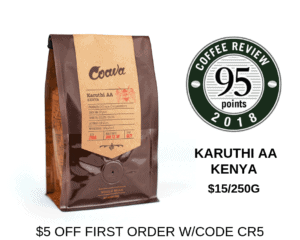 The Rwandas from Klatch and Johnson Brothers Coffee, both at 93, showed more intensity and aromatic fireworks, the Klatch adding lots of honey and flowers, the Johnson Brothers rich, forceful acidity together with deeper-toned, less berryish fruit. The Willoughby Burundi (92) expressed the sweet/dry character with extraordinary floral complexity, the floral suggestions ranging from brisk, bitterish lavender to sweetly lush jasmine. Most of the five Tanzania coffees that arrived for our cupping appeared to come from the southwestern growing region near the town of Mbeya, and tended to be softer, both less complex aromatically and less bright in acidity, than the coffees of Rwanda, Burundi and Kenya. Perhaps growing altitudes are lower in the region, or typical varieties grown are less distinctive. The Temple Nzovu Tanzania (90) displays the dry berry character I’ve been carrying on about, but with less intensity and perhaps more gentle balance than the higher rated Rwandas and Burundis. Coffee drinkers who avoid intense acidity may find it a more drinkable coffee than they find some of the higher rated samples. The same might be said of the Kéan Tanzania Mpito (90) and, moving back to the west, the gently elegant Johnson Brothers Rwanda Kinunu (91).